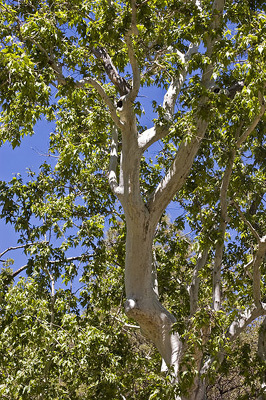 A medium sized tree, usually branching low with a spreading, open canopy. Leaves are alternate, simple with 3 to 5 pointed lobes, somewhat star shaped, green above, pale green and fuzzy below, 4" to 9" wide. Bark is very attractive and striking, smooth gray-green when young. When mature, the bark begins to exfoliate into large "jigsaw puzzle" shaped pieces, revealing nearly white inner bark. The constantly shedding bark creates an ever-changing mosaic of color.